ArtyFartyAnnie: Roll Up! Roll Up! It's all the fun of the fair over at Tag Tuesday this week - pop over and have a look at all the inspiration - here's my version. 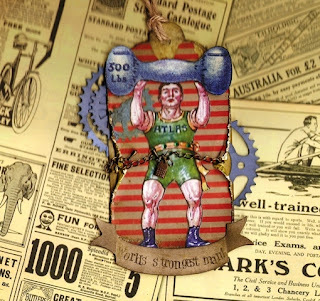 Atlas, the World's Strongest Man, is cut from an image I found on Graphics Fairy (click on the button on the right - so much to see!!!) The tag has two layers so I could sandwich the cogs in between and both were inked and distressed. The scroll was cut with a Bigz Die, then stamped, inked and gilded. Finally, I added the piece of chain from an old necklace and a bit of bling to his belt.